that make the Ragdoll cat a pleasure to own. 1. They go limp when held. them apart from many other breeds. 2. The breed is people orientated. 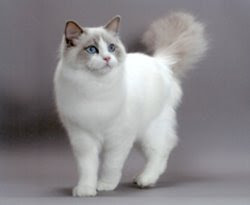 hovers around a Ragdoll cat may not be the cat for you. 3. As a breed they are calm yet love to play. The breed retains a lot of kitten in them as they grow up. 4. They adapt to living in small spaces well. adapt easily to living in an apartment. 5. You can train a Ragdoll cat to do tricks. takes is a little encouragement and you are off and running. 6. They are not destructive in the home. you have a lot of breakables. 7. Their plush coat does not require excessive grooming. another reason they are a great indoor cat.